ALC emphasizes a positive and systematic approach to teaching skills and reducing problematic behaviors. We take a creative and flexible approach, capitalizing on the resources available for each child. While there are certain teaching techniques that we have consistently found more effective, we also recognize that each person providing therapy has their own individual style and unique contribution to make to the therapy process. Early in the therapy process everyone needs to adhere closely to the therapy protocol. As the child masters skills, we encourage variability in style so that the learning generalizes to all persons and places in the child’s environment. Our curriculum is tailored to the individual needs of each child. We focus on skills that the child will need to be successful in a variety of settings and enjoy life to the fullest. This includes the typical areas of deficit for children with autism, including communication, social, and cognitive skills. This often involves active teaching of skills, such as imitation and play that children with autism may not develop independently. 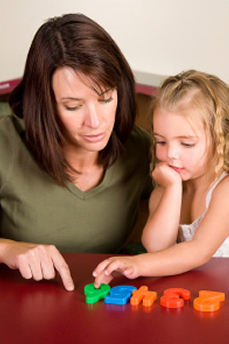 A strong emphasis is placed on learning language skills using the principles of Skinner’s verbal behavior. Our curriculum also includes a range of self-help skills; from basic skills such as dressing and toilet training to more advanced skills such as street safety and community outings. Often children with autism need specific instruction to generalize skills they learn from one setting to another, or from one teacher to another. Our curriculum also includes opportunities to address the child’s need to practice new skills in a variety of settings and with a variety of people, including their peers. When appropriate, our program is also able to provide instructors to shadow the child at school, camp, or other community settings. The curriculum is developmentally sequenced so that easier concepts are taught first and complex skills are introduced as the child learns the prerequisite skills. It is important to build upon a child’s strengths and interests and expand those skills while teaching new ones.